Congratulations to Ali Smith on winning The Baileys with How To Be Both. I recommend the interview with her in The Guardian, illuminating on many fronts. As someone who has just written an essay on form for a forthcoming on-line ‘special’ for New Welsh Review, and whose mind has been deliciously engaged for weeks on storytelling across genres, I read her thoughts on narrative avidly. I love this, her insistence on the corporeality of storytelling, the tangible impact good writing can have on our bodies…. Something we can all aspire to. 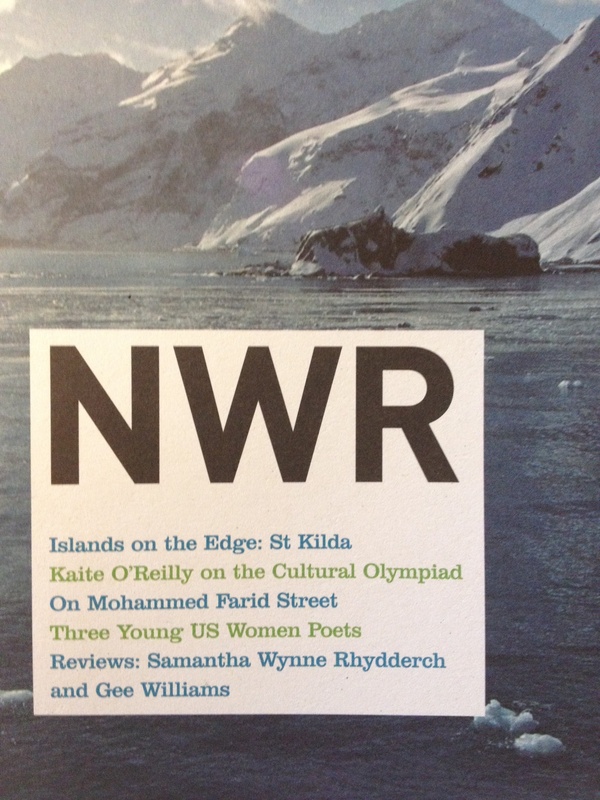 New Welsh Review 96: Kaite O’Reilly on the Cultural Olympiad. It’s 1995 and I’m lying in front of the wheels of a bus in Wood Street, Cardiff. The bus is ticking over, the driver occasionally revving the engine to try and scare me and so dislodge my body from beneath his bumper. As he does so, a thrilling reverberation is sent through the fat rubber of the wheel and into my waist. I am exhilarated and equally terrified. I haven’t been in an accident; I’m participating in a demonstration by the disability rights movement’s Direct Action Network, insisting ‘public transport’ is indeed public and accessible to all. DAN have brought the centre of Cardiff to a standstill, and other disabled activists have halted the trains at Cardiff Central. My contribution to the protest is over swiftly. Within seconds I’m yanked out by my feet. When NWR editor Gwen Davies asked me to write an article for the Summer issue of the journal, reflecting on the Cultural Olympiad and my Unlimited commission In Water I’m Weightless, I was happy to oblige. The Unlimited commissions have allowed me to develop a complex piece of work over a considerable period of time, and will culminate in a performance by Deaf and disabled actors, on a national platform, creating a significant political and cultural precedent. John McGrath of National Theatre Wales will direct the montage of my text, Nigel Charnock’s movement/choreography, and media artist Paul Clay’s video/design. Literary journals and reviews are important to our cultural landscape. They are often our champions as well as our critics, providing a platform for the emerging, and established writer. I always think they are worth supporting – we need to be the readers as well as the writers.